One of the primary initiatives of the AIRR (Adaptive Immune Receptor Repertoire) Community has been to develop a set of metadata standards for the submission of immune receptor repertoire sequencing datasets. In order to support reproducibility, standard quality control, and data deposition in a common repository, the AIRR Community has agreed to six high-level data sets that will guide the publication, curation and sharing of AIRR-Seq data and metadata: Study and subject, sample collection, sample processing and sequencing, raw sequences, processing of sequence data, and processed AIRR sequences. The overall goal of this standard is that sufficient detail be provided such that a person skilled in the art of AIRR sequencing and data analysis will be able to reproduce the experiment and data analyses that were performed. Are you ready to submit your AIRR-seq data? 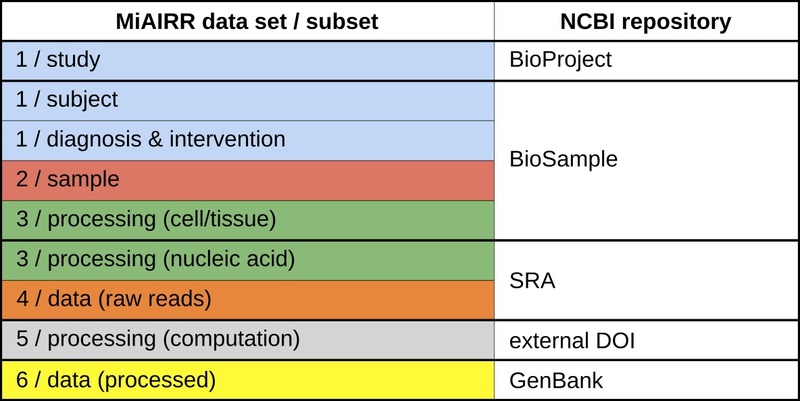 Click here for a detailed “how-to” guide for submission of AIRR-seq data to NCBI databases (BioProject, BioSample, SRA and GenBank). The development and implementation of the AIRR data standards in NCBI will benefit the whole AIRR community and accelerate widespread use and adoption of immune repertoire research.